On November 23, the Leading Party Group of State Administration for Market Regulation (SAMR) organized the study event on E-commerce Law and the 2nd lecture forum on market regulation. 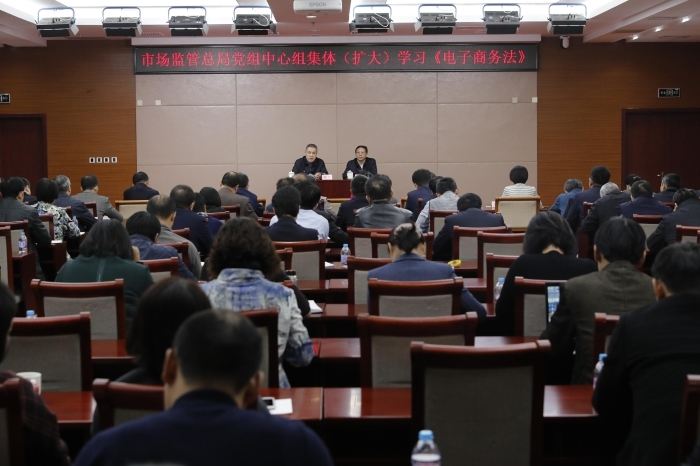 Yang Heqing, Deputy Director of the Office for Economic Law under the Legislative Affairs Commission of the NPC Standing Committee was invited to give a lecture concerning the Law. Zhang Mao, Secretary of Leading Party Group and Head of SAMR attended the study and made arrangements on the implementation of E-commerce Law. Ma Zhengqi, Member of Leading Party Group and Deputy Head of SAMR presided over the meeting. Other SAMR senior officials also attended the study, including Tian Shihong, Liu Shi and Sun Meijun. - to establish the concept of modern market regulation, enhance internal and external coordination and bring into full play the role of industrial self-discipline and social co-governance to promote the coordinated administration of network. In the summary, Ma Zhengqi requested the market regulation authorities of various levels to combine the study of E-commerce Law with the implementation of SAMR plans, the promotion of market regulation reform and the fulfillment of position work and responsibilities to ensure the smooth implementation of the law based on in-depth study and mutual promotion. Over 800 senior officials from SAMR departments, the discipline inspection and supervision group stationed in SAMR and directly affiliated units as well as the relevant departments of National Medical Products Administration were present at the study meeting.